A very good lesson today in navigating life’s temptations, challenges, and trials. Give it a read. Long trips early in our married life also turned into learning experiences. My wife enjoys the travel experience and prefers not to feel rushed. I preferred to conquer the drive. Frequent stops for shopping, eating, and bathroom breaks were a normal part of the journey for Lisa. In my opinion they were the enemy of a successful drive. The tension around this rose a bit as children arrived. We survived those challenges and we’ve grown to have a much more aligned view on our travel. Today I still plan the trips with an estimate of the journey’s duration given to the family. But we include time for potential stops. We talk about it ahead of time and generally come to agreement. And travel is much more harmonious. The biggest difference in me is that I have realized that in my journeys, like in my life, if I make a plan seeking the Lord’s guidance and then give it to the Him, then I can let go of the need to MAKE IT HAPPEN. I can relax and trust Him with the outcome. This is liberating. An illustration comes to mind. In a way it is like having a map and having the travel app WAZE on. I see the path to take on the map. But as I travel, WAZE is giving me commentary on the road ahead. It tells you of traffic ahead and reroutes you around it. You may still encounter a bit of a slow-down, but in the end you get around it in a bit better time and you make it to your final destination. The comparison for me is to reading the Word and listening to the Holy Spirit. When I read the Word I am encouraged, I gain direction for my life, I see a life to live that is pleasing to the Father and something I desire. But when I step out the door and into all the activities that make up life, I need the Holy Spirit to help take the truth of scripture and apply it to the myriad real life situations I encounter. I used to have a problem when things interrupted my plans for the day. I am much better (not where I know I need to be yet, but better) today about letting the interruptions play out. I have learned that often in the interruptions God intervenes to teach me or use me in ways that wouldn’t have happened on the path I had planned. Last night is a case in point. I don’t remember exactly what I said in response, but we engaged in a bit of a conversation as she rang up our groceries. It turns out we had a slightly similar experience to share and encourage her from. It was just a few brief words of encouragement, but it seemed like they were somewhat of a help. But I think the bigger thing was the last thing we did. As she totaled our purchases and turned to me, I knew I didn’t have a specific answer to her dilemma, but I knew Who did. I asked if she minded if we prayed. Well she didn’t say “No.” so I reached across, took her hand and prayed a simple prayer of faith asking the Father to give her guidance and to bless her. I walked away chuckling at God’s goodness. We took a detour. Shopping is not my thing at anytime, but especially late in the evening when I am ready for bed. But that little detour meant a young woman was encouraged and hopefully will make it to a place where she can meet the One who loves her more than she can imagine. When we let go and let God, He will take us to the places we need to go and allow us to experience things that fit into His perfect plan. Just let Him navigate and you will enjoy the ride of your life. Take care my friend and enjoy the ride. I went to a state park near where I am working this week, picked up a trail map and selected a Moderate trail, 3.9 miles in length. I was feeling pretty perky. Since there where no topographical lines on the map, I made my best guess which way would provide the best grade. OK, for those not familiar with running, er jogging for the middle-aged and somewhat conditionally challenged, the best grade means as little uphill running as possible. I guessed right, or at least the first 3 miles seemed so. A fairly long, but gradual downhill was followed by a few slight rises. All in all the first three miles were sufficient to have me pondering the goodness of God. I began to see how trail running can be a good metaphor of life with it’s up and downs, periodic ruts, times of running in the brilliant early evening sunshine followed by the dusky shadows of the deep woods. I came to a rather long flat section about three miles in and that perkiness really kicked in. I picked up my pace. Turtles and snails were no longer my trail companions. Seventy five yards or so later I was beginning to congratulate myself on being slight less winded than I thought I should be when the trail turned… and went up…really up. Like somebody forgot this was a trail around the base of Morrow Mountain and not over the mountain. I lowered my vision to the trail in front of me and plodded purposefully up the ever steeper slope. The biggest problem I had though was that I had looked at the dauntingly steep slope and it was in my head as well as being a real physical challenge. As I slowed my pace to get my heart rate back off the edge I had to laugh as several obvious realizations came to mind. First that long downhill to start my run was followed by a number of approximately equal rises and falls. Logical conclusion #1, I still had the height of the long gradual downhill to climb to get back to my car. That height difference had to be made up. Since I didn’t have a clue of the topography in this area, it appeared that the route I took was the gradual side and this was definitely the steep side. Logical conclusion #2, it is okay to walk if it is too steep to run. Logical conclusion #3 was related, to #2, it is better to walk, laugh about it, write a blog about it, and survive than to die of a heart attack trying to run up a hill in the woods where I hadn’t and didn’t see another soul the entire time I was out there. Logical conclusion #4. The trail was a combination horse trail and jogging trail. The designation of the trail being Moderate was probably for those riding a horse. Where I was did NOT feel the least bit moderate… even when I slowed to a walk. Logical conclusion #5 (perhaps the most important learning from my run), trail running is a lot like life. (I know I had already started down this trail earlier, but I think the Father was just getting me ready for the real lesson.) Sometimes we do have downhill runs where it is great and we are seemingly carried along. Sometimes there are slight rises that correspond to the challenges that periodically come our way. We press on through and are made stronger because of them. Life will bring us to times that press us to our limits. I believe in God’s sovereignty. Nothing that we come up against is outside of God’s knowledge and allowance. There are three sources of challenge we will routinely encounter. 1) Some we bring on ourselves. In those situations the best approach is to quickly acknowledge our error/mistake/sin, turn around, and ask God’s forgiveness and help. 2) Some are attacks of the enemy of God and His children. If we ask for discernment, God will provide it. When this is the source we are to stand firm in faith, resist the devil, and call upon our mighty Warrior & Savior to intervene on our behalf. 3) Finally many are due to the fallen world we live in and God’s desire to live through us in a manner that strengthens us and provides a consistent witness of His Grace to others. Again standing firm in faith is called for, but additionally praying for the opportunity to shine brightly for God through the time of testing is appropriate. We do not know all the good God wants to bring through our patient perseverance, but we can cooperate with Him by praying and resting in Him. Before I knew it I was at the top of the steep hill. I looked back down and realized I had made a significant elevation gain in a short period. I almost prayed, “Lord make that the end of the uphill”, but I didn’t. Instead I started jogging again, a little slower perhaps to conserve a little more energy, thinking about how good God is to provide life lessons in such a beautiful classroom. Have a most blessed day my friend. May God make the trail rise up to meet you and give you peace. We all have a purpose. In fact, most of us have multiple purposes. For example, with four children I know that one of my purposes is to love, train, and encourage my children to find and fulfill their purpose in life. I also recognize that I have a specific calling to be an encourager. It is a joy for me to have an apt word that picks someone up, that opens their eyes to possibilities, to see a truth click within them. Since I am flying a lot now I get to meet new people almost every trip. Yesterday I had the pleasure of sitting next to an encourager. Her name was Jeb. Jeb is a two-time cancer survivor – 8 and then 5 years ago. She was actually traveling home for an intermediate stay between visits to a hospital in another state. She is having follow up treatments for different ailment, one that had almost claimed her life recently. However her joyful, exuberant spirit belied her medical challenges and, if she had not told me, I would never have guessed that she had been through these challenges. One of the things we learned fairly early is that we share a faith in God and recognize that Jesus Christ in our savior. One story that Jeb shared about her second round of chemo really resonated with me. Having been through surgery and chemo once already, the memory of how difficult it was the first time weighed heavily on her mind. She asked the Lord to help her through and she specifically asked to see a minor miracle each day as she walked through the trial of chemo. Well, our Father honored that prayer. I was blessed as she shared a number of ways that God provided minor miracles every day. The side-effects were actually more severe the second time, but as she experienced God’s touch through miracles, primarily through nature, I could see that He provided just what she needed, when she needed it. Jeb accepted that she had cancer. But she chose to seek life holding firmly onto God’s hand. And because she did, I had the opportunity to be encouraged by her. Thank you Jeb for sharing your life with me in that hour or so we sat and chatted. And thank you Father for arranging divine meetings. I recognize that not everyone has the calling of being an encourager, but we all are called to know God and make Him known. I encourage you today to seek His face. He is there and He will respond. Faith is necessary, but my experience (as well as the testimony of scripture) is that if you truly and earnestly seek Him, God will meet you where you are and draw you to Himself. And life with Him is our ultimate purpose. I hope to post an encouraging word each day through Lent. Please feel free to comment. I would also love to pray for or with you. Send me a private message and we will correspond. Be blessed today my friend. I am still learning how to live the life Jesus saved me into. I’ve been His disciple for over 30 years. Now I won’t argue that sometimes I can be a slow learner, but I believe it is more than that. The forgiveness of our sins and the redemption of our souls from death to life takes place in but a moment when we repent, turn to Him and accept Him as our Savior and Lord. But the process of sanctification takes a lifetime. Standing still…remaining the same is really not a viable option. It is well to remember this and to use the gifts He has provided to help us on our way. When we become His, we are sealed with the Holy Spirit. God comes to live in us in the form of the third person of the Trinity. The Holy Spirit is our counselor, out helper, our advocate (John 14:15-21, 16:7-15). The Holy Spirit is not an “it”, but rather a real and distinct person of the Godhead intimately connected to the Father and Jesus. Looking at Jesus in the bible we observe a wise, loving teacher who also healed, delivered, and ministered in whatever way He determined was needed. The Holy Spirit living inside the believer will do much the same to and through us. However the Holy Spirit is gentle. He will not force us to do what we do not will to do. This is vitally important. Even though Jesus saves us, He does not ruler as a dictator. It is a day-by-day, step-by-step process of our relinquishing control to Him. His Spirit, the Holy Spirit living inside us, will gently lead us into truth and right action. But we have the ability to choose to take the step He leads us to or not. Jesus talked about this as dying to self and taking up our cross and dying daily. It is a longer topic that we won’t dig too deeply into today, but a person’s willful defiance of the Holy Spirit can manifest itself in three negative outcomes – grieving the Holy Spirit, quenching the Holy Spirit, and blaspheme against the Holy Spirit. I love the Lord and I do not want to offend the One Who paid such a dear price to redeem me, so I don’t ever want to do any of these. However being truthful I know on a handful of occasions I have failed to obey and grieved the Holy Spirit. It pains me to remember these times, but God is gracious. He brought me through each of those with a greater love and determination to follow Him. Suffice it to say my experience is a little like Peter’s. Peter denied knowing Jesus to save his own skin and then realized he had done exactly what Jesus predicted. He was broken and for a time his relationship with the Lord was strained. This conviction though resulted Jesus’ restoration of Peter which brought him to a place of greater devotion and commitment. Because of God’s grace this is possible for us as well. This morning as I think of the other “helps” the Lord provides, I realize they are all subordinate to the gift of the Holy Spirit. The bible is the divinely inspired Word of God, but it takes the Holy Spirit to make it come alive and apply it to our lives. The Church is the body of Christ, but it takes the Holy Spirit to guide the leadership and connect the members so that the body moves in fluid, God-directed motion. I have learned that rest and quiet time with the Lord is an essential ingredient in godly growth. If we are not careful are lives can become frantic activity followed by a crash. Our lives must have a balance that includes quality time, time when we are mentally sharp and spiritually receptive, to just sit in the Lord’s presence. In these time the Holy Spirit will often make the connections of God’s Word to our life. That is what I felt the Lord put on my heart to share today. 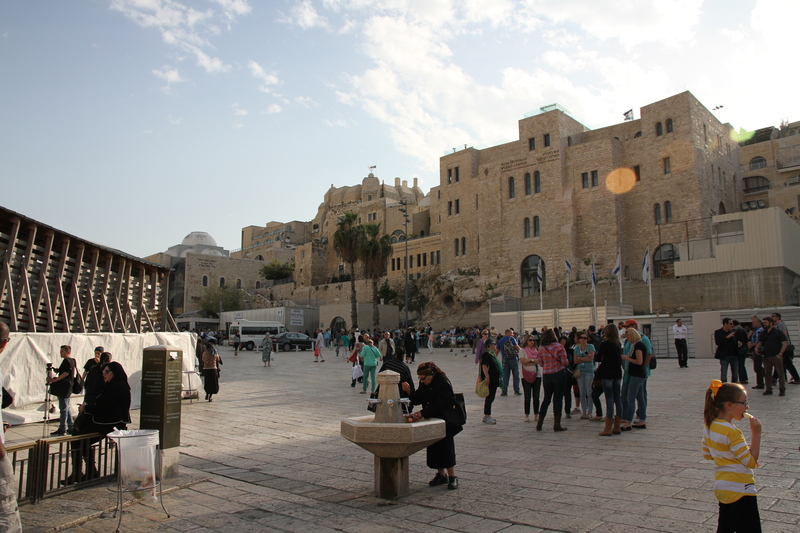 I also intended to share pics of Jerusalem with you during this Holy Week. 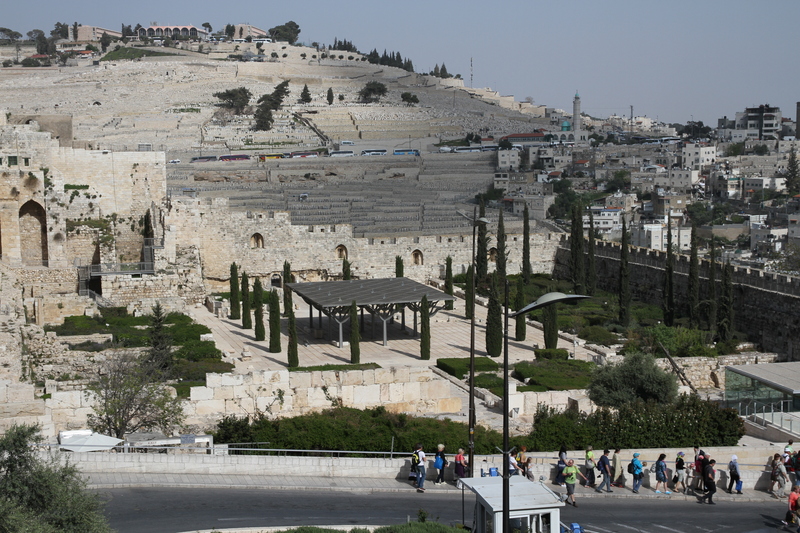 As we discussed yesterday on Palm Sunday Jesus rode into Jerusalem from the Mount of Olives. He drove the money-changers and animal sellers from the Temple court yard. 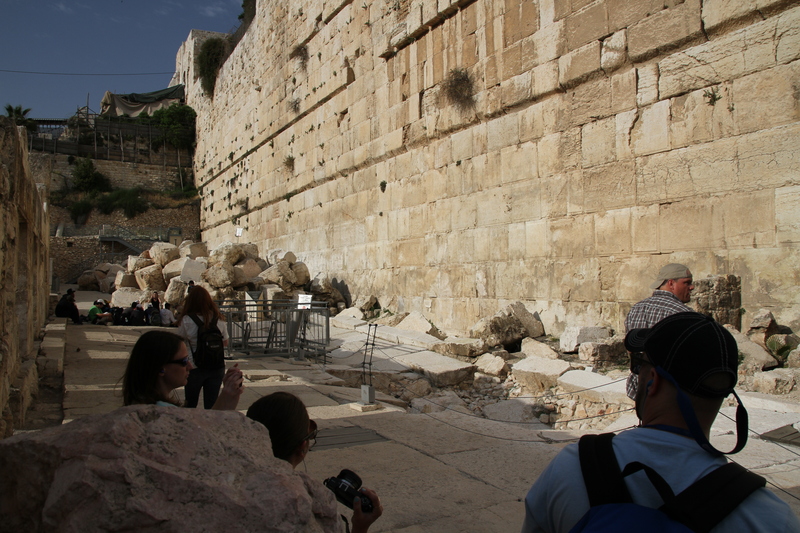 Obviously the Temple is no longer there, but I have pictures of the wailing wall and the remnants of the Temple Mount that are now part of Dome of the Rock structure. 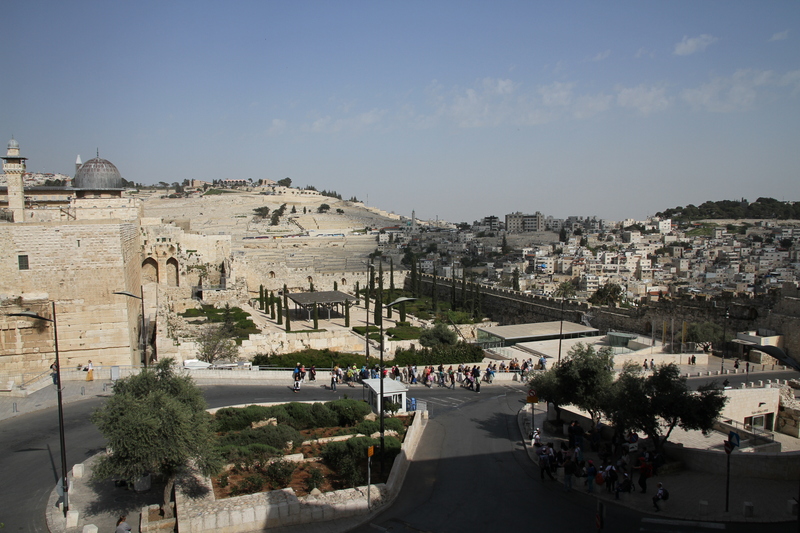 Mount of Olives in the background and the south end of the Temple Mount on the left side. 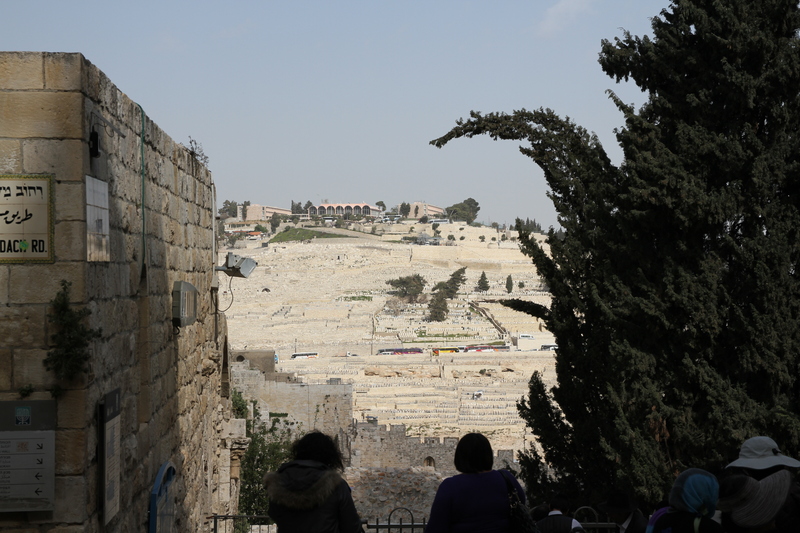 The city of David goes down the south side of the Temple Mount below where the Temple stood. This is the southeast corner of what was the Temple wall. 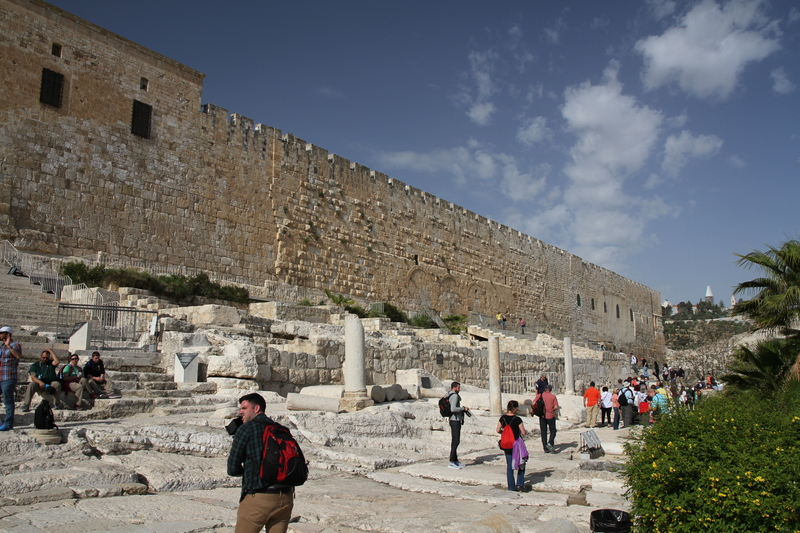 It was torn down by the Romans around 70 AD fulfilling Jesus prophecy. Later parts of it was rebuilt as fortification through the Crusades era. Wailing wall which is actually a portion of the old Temple was that has been rebuilt as part of the Muslim Dome of the Rock structure. Women side on the right and men on the left. 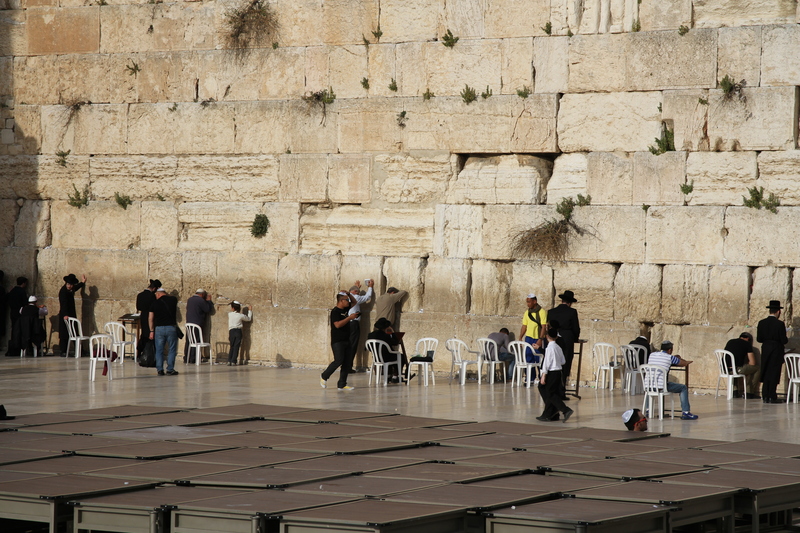 View of the men’s side of the Wailing Wall. People utter prayers, write them on pieces of paper, and then stick them into cracks in the wall. We even found some around on the south side of the wall. 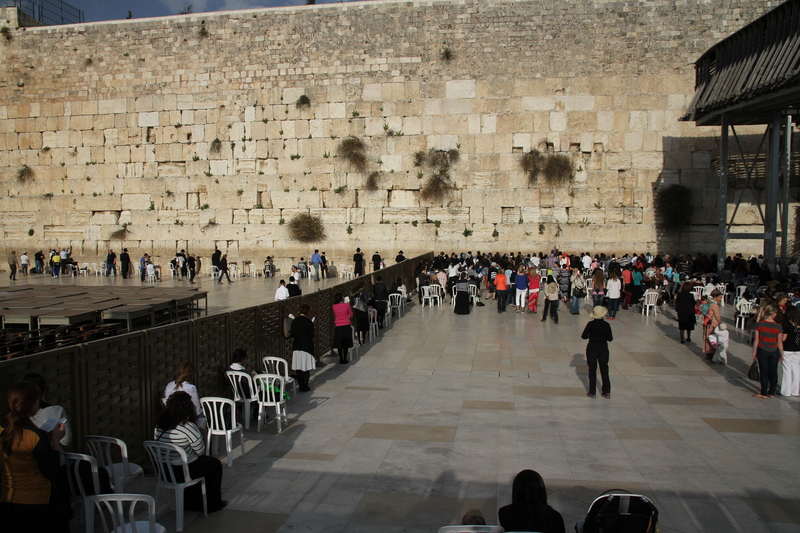 View of the courtyard in front of the Wailing Wall. 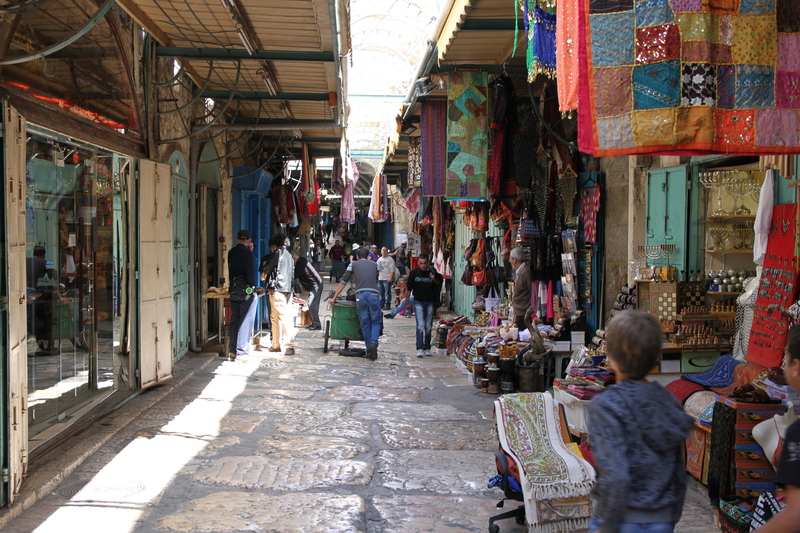 Typical street scene in the Old City. 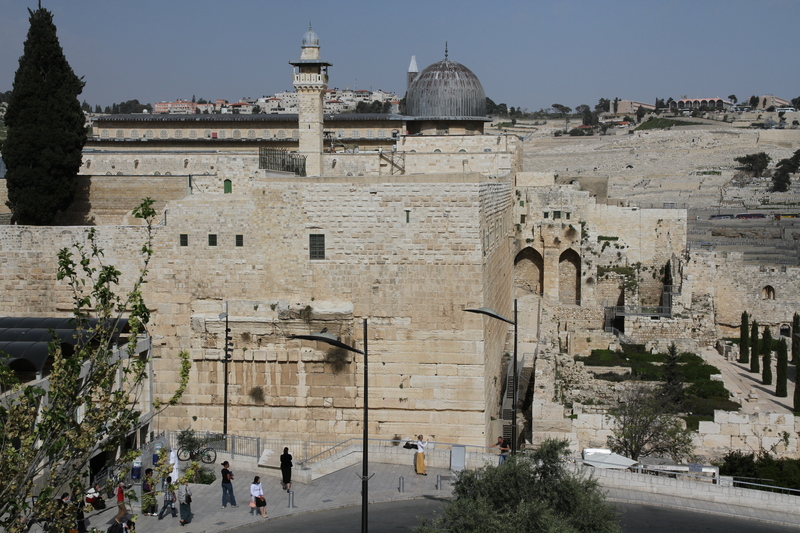 The Old City is inside the walls and it is divided into four quarters – the Jewish, Armenian, Catholic, and Muslim. 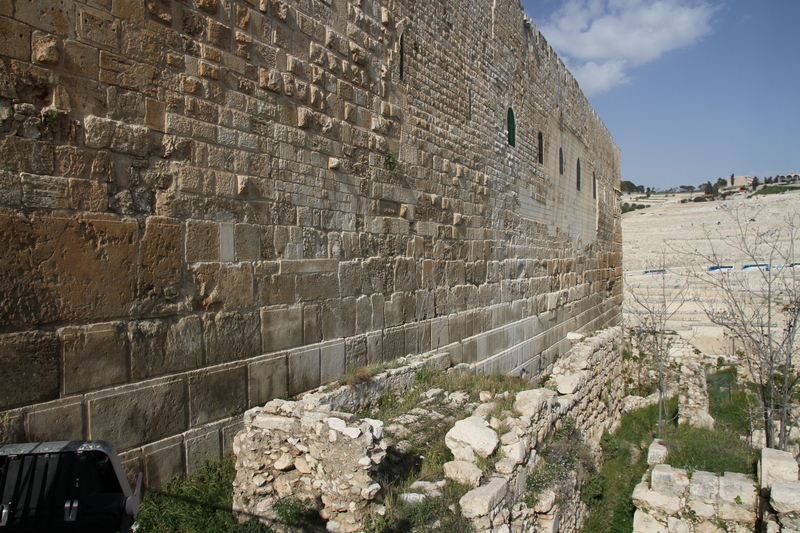 South wall of the Temple Mount. My understanding is that it was torn down by the Romans, but later rebuilt as protection. It now surrounds the Muslim Dome of the Rock and a couple of mosques. 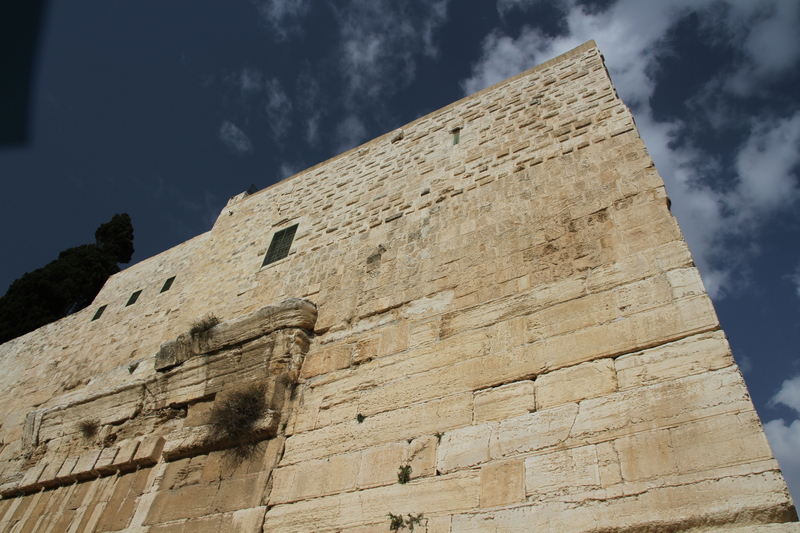 This is the southeast corner of the Temple Mount wall. Because the mount is falling away at this point this would be a high point, if not the highest point of the Temple. The story of Satan taking Jesus to the high point and saying throw yourself down from here could have taken place at the top of this wall. Rubble uncovered from when the temple was destroyed in 70 AD. I hope you enjoy the pictures and are edified by the blog. Be blessed today and be the Lord’s blessing to someone today. Promises, promises, are you a promise maker? Promises, promises, don’t be a promise breaker. To say that our society functions on a foundation of trust comprised of thousands upon thousands of promises is not a stretch. So how are we doing? A building is only as good as its foundation, so how are we doing? An honest assessment has to say we are not doing very well. With divorce at over 50% of marriages, personal and business bankruptcies skyrocketing, and 40% of all children raised with no Dad in the picture we are not doing very well keeping our promises. So if promises are essential and commonplace, but keeping promises is apparently becoming harder – what are we to do? What are the consequences? Should we be worried? What can be done about it? My first comment about never making promises was obviously a bit tongue in check. Promises are essential. Every agreement includes within it a promise usually more than one promise. Lawyers exist to “help” interpret promises and see that promises are adhered to. I was raised in the day when a person’s word was his bond. I still live by this belief and I find many people who would like to, but they have been burned by others to whom a promise is superficial chatter and not a binding agreement. Even though I believe a promise is sacred, honesty demands that I admit I have said things that I fully intended to fulfill which have not come to pass. I want to hike around Mt Ranier with my youngest son and I have told him we would, but time is getting on and we have not made the trip. While technically not a promise broken since there is still time, it is definitely not a promise fulfilled. I saw a political commercial last night which showed a candidate making many promises in the last election and then it showed him breaking those very promises. It was obvious that the person made promises that they did not keep. If the most powerful people in the world struggle to keep their promises, then what shape are we really in? Well if our hope, trust, and faith are in them, then we are in pretty dismal shape. Fortunately there is a higher authority that we can and should look to. And His track record on promises is perfect. He never fails to keep His promises. The bible says that it is impossible for God to lie. A broken promise is at its heart a lie. Since God cannot lie, He cannot break a promise. I have found this to be true as have millions of others throughout history. God is a promise maker AND a promise keeper. God’s first promise to me was “Dan, I will never leave you or forsake you.” And that has been true. God has always shown up. In the most difficult times of my life He has been tangibly present. Sometimes it is through the extended arms of His children. At others it is through a perfectly timed verse. Sometimes it is a gentle peace within my spirit. The point is for 28 years God has kept His promise and I know He always will. While this promise was whispered to me when He brought me to Himself, this is a promise He offers to each and every one of us if we but put our trust in Him. Now it is important to mention something God does not promise. He does not promise a life free from pain, difficulties, challenges. No, these are a part of life that we will from time to time have to walk through. But what we can hold on to are specific promises God has given for us at these times. From Isaiah 43 we see God promising that when floods threaten to overwhelm His people He will be with them. When fire is upon them, He will cause them to walk through and not be burned. It does not say we won’t have times that threaten us and cause us pain, but it does say He will carry us through. Now I have to say I have learned that “carrying through” includes two important considerations. First, is a relationship with Him. God will respect our decision to keep Him at arm’s length, but that makes His help less tangible. It’s not His decision, but ours that makes this so. (And people often blame Him for this?) Second, some of His promises have a complete fulfillment in the eternal perspective. I have a friend whose son was diagnosed with leukemia. He fought it bravely and experienced a couple of years of remission. The disease returned and an auto-marrow transplant was determined to be his best option so this is the path they took. During the window of time immediately after the transplant the patient is extremely susceptible to any illness. My friend’s son caught something and went downhill until he finally went into a coma. For 40 days we prayed for Chase. Our focus was upon Chase getting better and coming out of the coma. For 30 days I prayed for this, but as time and prayer continued with little change in Chase, I began to realize that God was speaking something different into my spirit than what I was praying. I began to see God revealing a bigger perspective – an eternal perspective to my prayer for Chase and his family. The last days of Chase’s life here were more peaceful for Chase and his family because they recognized that God was walking with them in the working out of His will. Chase’s life and death led to others being reconciled to God and being inspired to live a life of faith. We are called to let Christ reign in our lives. As His Holy Spirit resides in us and we cooperate with His transforming work, we become more and more like Him. We become promise makers. I started off by saying that the only way I have found not to break a promise is to not make a promise. A more accurate statement would be to become so surrendered to God that we only make promises He prompts us to make, and become even more surrendered to Him to allow Him to help us keep them.